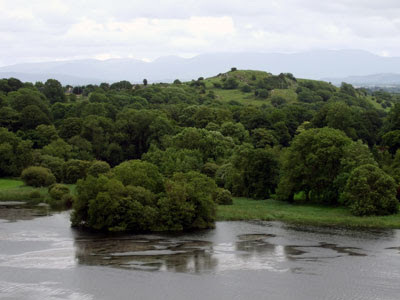 On Canada Day (July 1st) I was with my family, climbing the somewhat boggy hillside around Lough Gur, an area in County Limerick steeped in history and, indeed, pre-history. But on this occasion we were thinking less of the Celtic and megalithic peoples who once lived here, than we were of the variety of animal life around us. 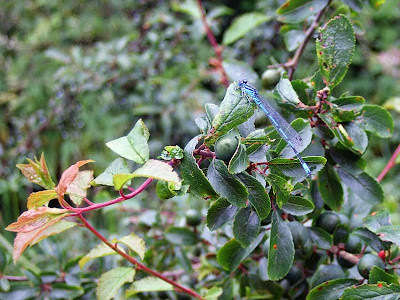 Climbing the hill over the visitor's centre, we found ourselves walking through clouds of lovely blue dragonflies, one of which didn't mind perching on my finger. The way up the hill was rather nettle-ridden and a bit dangerous given the steepness and mud. We found one discarded mobile phone, obviously fallen from the pocket of a not-so-prepared hill walker. Climbing Knockfennell on the north side of the lake was a bit of a challenge in the loamy ground, and not recommended for someone with a twisted back (doh!). It's steeper than it looks and the ground underfoot is not always stable. But it was well worth it on the day to witness the caterpillar "infestations". (Funny how things we dislike "infest" while things we like are "bountiful" or some such.) 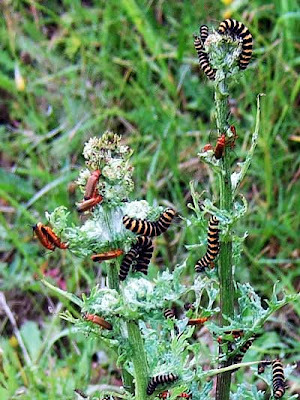 These larvae seemed to enjoy one particular type of plant, sharing their food with some sort of winged beetle as seen in the picture. From halfway up the hill there was a nice vista of the countryside, looking back across the lake in the direction of the road approach to the Lough. This photo would then be facing south-east with Bolin Island the little cluster of trees in the foreground. This is more notable than it looks, as it was a crannóg, or artificial island, used as a home in days long gone. I don't know the date of this one, but crannógs have been known to be 5000 years old and some of the other remains at Lough Gur date to that time. 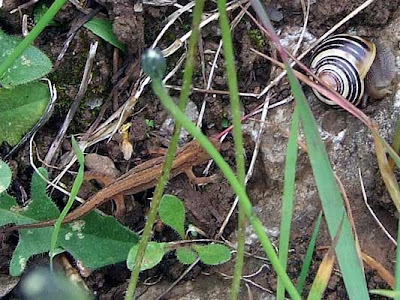 It was while we were halfway up Knockfennell that we made a discovery, a specimen of Common Lizard (Lacerta vivipara), the only reptile native to Ireland. While "common" in name, and widespread in habitat, this little fellow is rarely seen. So much so that a couple years back the Irish Wildlife Trust ran a National Lizard Survey to find out more about where they lived. It was a speedy little dude, and didn't wait for the snail to get out of its way, walking right over the mollusc. Finding this animal really made our day. 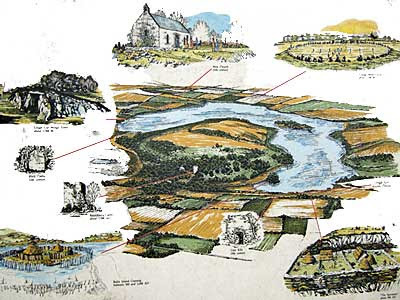 Anyone visiting this part of Ireland should spend half a day in Lough Gur to check out the Grange Stone Circle, Wedge Tomb and other "sites of interest". Don't let the clouds and rain put you off -- landscape like this is better in the rain. But look out for lizards underfoot! all images © Robin Parmar 2007.